Dungeons & Dragons Spellbook Cards - The Spellbook Cards card decks are an invaluable resource for any magic-user. Having all of your spell details right at your fingertips saves you having to spend time searching through books in the middle of an encounter. And you can easily consult the entire deck when selecting new spells to learn. After each long rest you can set aside those spells you want to prepare for the day. Each deck is made from thick laminated card so they will stand the test of time. Class packs include Arcane (257 cards for all Wizard, Warlock, and Sorcerer cantrips from levels 1 to 9). Cleric (153 cards for all cantrips and spells from level 1 to 9). Druid (131 cards for all cantrips and spells from level 1 to 9). Bard (128 cards for all cantrips and spells from level 1 to 9). Paladin (70 cards for all spells from level 1 to 5). Ranger (46 cards for all spells from level 1 to 5). Xanathar's Guide (96 cards that expand the options available for spellcasters of all types). Dungeons & Dragons Spellbook Cards: Martial Powers & Races - This spellbook contains all the maneuvers available to the startegic fighter as well as innate spells for various races of the realms. 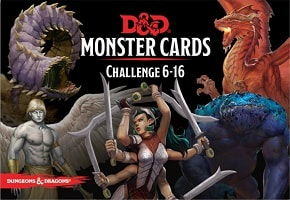 Contains 61 durable, laminated cards including: 16 Battlemaster maneuvers, 3 totem Barbarian abilities, 19 Monk techniques, and all the spell like racial abilities for the Aasimar, Drow, Firbolg, Forest Gnome, Genasi, High Elf, Tiefling, and Triton Races. Dungeons & Dragons Curse of Strahd: Tarokka Deck- The Vistani have long been masters of fortune telling. In the hands of a Vistani seer, tarokka cards can tell tales of the future and provide answers to many a dark and mysterious question. Includes 54 Tarokka cards, handy for a trek through Barovia, as well as Prophet's Gambit, a card game for 3-5 players. 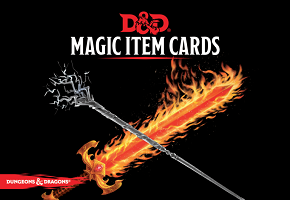 Dungeons & Dragons Magic Item Cards - This set contains 294 durable, laminated cards for a hoard of magical weapons, armor, and other wondrous items. With game statistics on one side and evocative art on the other, they are the perfect tool to help Dungeon Masters equip their villains or dole out rewards to their players’ heroes. 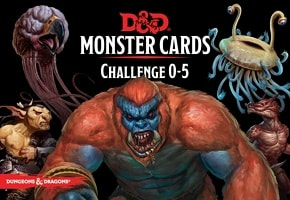 D&D Spellbook Cards Monster Deck 0-5 - This set contains 179 durable, laminated cards for a range of deadly monsters of challenge rating 0–5. With game statistics on one side and evocative art on the other, they are the perfect tool to help Dungeon Masters manage and reference their menagerie during play. ​on one side and evocative art on the other, they are the perfect tool to help Dungeon Masters manage and reference their menagerie during play. Dungeons & Dragons: Waterdeep Dragon Heist Dice Set - premium dice set for the world's greatest role-playing game. Whether you’re planning the next caper or simply spending a night on the town in Waterdeep, don’t go without a trusted set of dice in hand. Includes: Two d20s, one d12, two d10s, one d8, four d6s, one d4, and one hit point tracker. Dungeons & Dragons: Waterdeep Dungeon of the Mad Mage Map Pack - Chart a course through the greatest dungeon in the Forgotten Realms in this accessory for the world’s greatest role-playing game. Hundreds of years ago, long before Waterdeep was built, Halaster Blackcloak carved a vast dungeon beneath Mount Waterdeep and stocked it with all manner of creatures from across the planes. Though it is likely impossible to map out the entirety of Halaster’s domain, the maps contained herein lay out the bulk of this deadly dungeon and are certain to lead you through many hours of play. 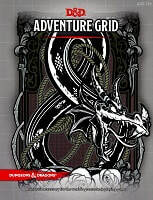 ​Dungeons & Dragons: Adventure Grid - A tactical accessory for the world’s greatest role-playing game. This sturdy double-sided, grid-lined play surface is ideal for when your Dungeons & Dragons campaign gets tactical. One side features a stone floor good for dungeon and city encounters alike, while the other features terrain usable for a wide range of rural and wilderness encounters. Additionally, the D&D Adventure Grid folds up for easy transport and storage, and can be used with both wet-erase and dry-erase pens interchangeably. 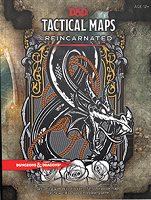 Dungeons & Dragons: Tactical Maps Reincarnated - Bring your Dungeons & Dragons game to life with this collection of twenty beautifully rendered, full-color, tactical poster maps. Maps are a key element of every Dungeons & Dragons campaign. A map’s importance in bringing your world to life can’t be overstated. The same can be said for your encounter maps. Sometimes you need a visual representation of the area your adventurers are in, or perhaps tactical combat is simply the way your group rolls. However you play, we’ve got you covered. Twenty beautifully rendered, tactical poster maps are contained herein, perfect for bringing any D&D game to life. ​Dungeons & Dragons Dungeon Tiles Reincarnated: City - Breathe life into your tabletop game with these full color dungeon tiles. 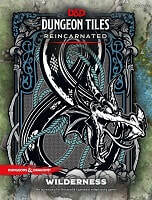 Infinitely expandable and easy to set up, these dungeon tiles allow you to create the adventures you want to play. Tiles to make fantastic city maps: contains 16 durable, double-sided, fully illustrated tile sheets, featuring city streets, buildings, sewers, and other terrain elements that Dungeon Masters can use to build exciting encounters. 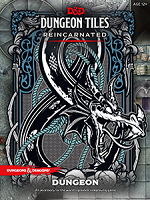 Dungeons & Dragons Dungeon Tiles Reincarnated: Dungeon - Breathe life into your tabletop game with these full color dungeon tiles. Infinitely expandable and easy to set up, these dungeon tiles allow you to create the adventures you want to play. 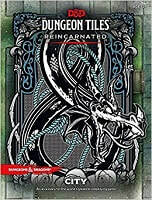 Tiles to make fantastic dungeon maps: contains 16 durable, double-sided, fully illustrated tile sheets, featuring dungeon rooms, corridors, caverns, tunnels, and other terrain elements that Dungeon Masters can use to build exciting encounters. Dungeons & Dragons Dungeon Tiles Reincarnated: Wilderness - Breathe life into your tabletop game with these full color dungeon tiles. Infinitely expandable and easy to set up, these dungeon tiles allow you to create the adventures you want to play. Tiles to make fantastic wilderness maps: contains 16 durable, double-sided, fully illustrated tile sheets, featuring grasslands, ruins, sandy beaches, and other terrain elements that Dungeon Masters can use to build exciting encounters.